Fat Bruce Lee was in a poor mood when he first reviewed The Habit Burger Grill, and a few of our readers suggested that the review was unduly harsh. Fat Bruce Lee, Happy Meal, and I returned to one of the many locations, this one in Sherman Oaks, to review this cheeseburger again. For $6.95 each, we got the Double Charburgers, fries/rings, and a drink. That was a lot of food for the price. Happy Meal got a vanilla shake to round out the meal. The staff was highly courteous, and they cooked our burgers, fries, and rings fresh to order. The Beef: They advertised that they used lean beef, which was ground fresh on a daily basis. The beef was pretty lean--maybe 15% fat Chuck, and it tasted fresh. There was no trace of aging, and the flavor was moderately beefy with no taste of iron. It was pretty standard tasting fast-food beef. It was certainly not juicy, but it managed to avoid being rubbery. The Sear: The sear was nominal in spite of the amount of smoke that came off of the gas grill while they were cooking the burgers. The patties got a little brown around the edges, but that was it. In spite of these being named Charburgers, not a trace of carbon was present to back up the namesake. The Seasoning: I watched them shake on a generous amount of a seasoning blend. However, this blend was sorely lacking in salt, but it was adequate in the pepper department. The Preparation: They cooked the burgers to Well-Done on a reasonably hot gas grill. During the cooking process, I watched the cook perforate the patties with a rounded turner. This created additional surface area, but because the grill was not quite hot enough, this did not result in additional browning. This process did release more of the beef fat, and this created an impressive amount of smoke during the cooking process. None of the smoke managed to stick to the burger to add that element of flavor, however. The Cheese: The American/Velveeta cheese managed to save the burger in terms of moisture, texture, and savoriness. The cheese was satisfyingly gooey, salty, and creamy. On a properly seasoned burger, this cheese would have been too much. 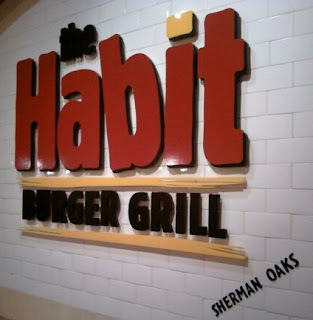 In the case of The Habit Burger Grill cheeseburgers, it was just about right. The Bun: This was a sparsely seeded, moist, standard hamburger bun. They only managed to toast the edges, which was unfortunate, because this burger really needed some crunch to make up for the lack of sear on the beef. 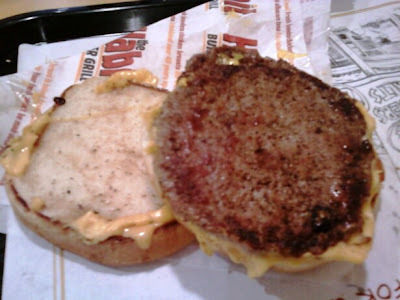 Meat to Bun Ratio: In the case of the Double Charburgers, the beef dominated the bun, and Fat Bruce Lee was unable to polish off all of the beef. 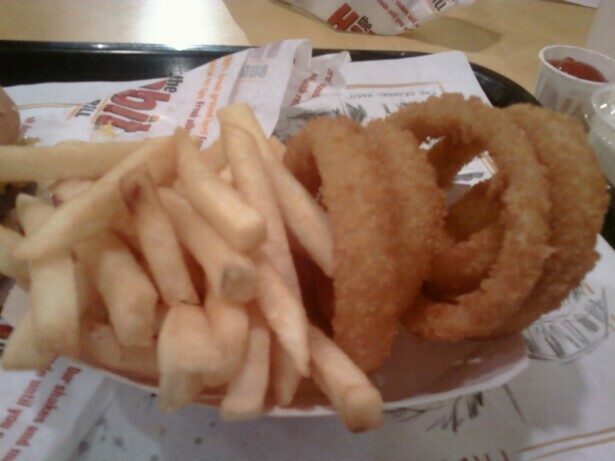 The Fries and Rings: These were fresh, hot, and crisp. They were far better than the Styrofoam sticks that one sees at In 'N' Out. The Shake: It was made from real ice cream, and Happy Meal pronounced it better than In 'N' Out Burger's premixed concoction. I had to agree, The Habit Burger Grill made a fine shake. The Value: For about 7 bucks, we were stuffed and satisfied, and none of us could finish our food. The value was good. 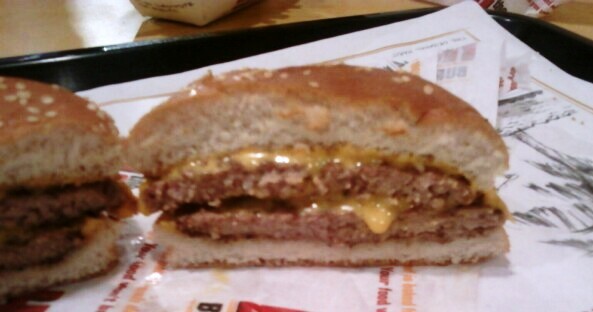 All in all, this was a slightly better than average cheeseburger. It was superior to In 'N' Out Burger and a step behind Five Guys Burgers and Fries. Burger Review : Drive past that In 'N' Out Burger, and go to The Habit Burger Grill instead. Glad to see you went back. This is one of my favorite go-to burgers up in SB. I order the charburger with cheese, bacon, and grilled onions. Sorted. jesus christ you're a moron. 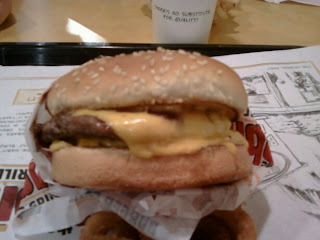 I can honestly say that the "burger" I tried to eat at the Reno, NV location was the WORST burger I can remember!!! The "meat" was NOT properly cooked,cold. and tasted like garbage. The bread (bun) was rubbery, hard, and cold. The fries were rock hard and cold. The soda machine was broken and yet they charged me for a soda anyway without telling me that there was NO SODA AVAILABLE!!!!.. The "manager" (for lack of a better title) didn't even offer to refund my money. All he said was that he would "go next door and get me a soda.. I told him that it was too late for that and all he did was say "SORRY" and walked away..